The Loulous are just like any other Kiwi family. However, unlike many in their neighbourhood, they have made a long and difficult journey to get here. The Loulou family (from left) Radwan, Ossama, Alaa, Abdul and Mona relax in their Lower Hutt home. Life in Wellington is a little different from life in Syria. The contrasts between language, food and climate are easy to spot, but some cultural differences take longer to notice. It’s something the Loulou family discovered when they decided to go kayaking one summer evening – only to find the kayak rental store closed at 5pm. The Loulous are just like any other Kiwi family. They argue over messy bedrooms, spend time together and tease each other in the way only families can. However, unlike many in their neighbourhood, they have made a long and difficult journey to get here. As war raged around them, Mona, her husband Ossama and their children Radwan, Alaa and Abdul were forced to leave their home in Baniyas and flee to Egypt. After almost two years of uncertainty, the family was accepted into New Zealand through the refugee quota. The Loulous arrived in their new home in Lower Hutt last year, where they’re now getting used to all the little differences life in New Zealand brings. As the primary provider of community refugee resettlement in New Zealand, Red Cross was on hand to support the Loulou family when they arrived – and to help them navigate those little differences. Red Cross supports and empowers new Kiwis as they rebuild their lives, assisting with everything from cross-cultural support to helping former refugees find work. Ossama, who worked as a marine engineer in Syria, is now using his skills as a general mechanic. His oldest son Radwan is a passionate football fan, while daughter Alaa has big career dreams – at this stage, she’s deciding between teaching and medicine. Every day, Radwan and Alaa bike to classes at Naenae College, where they enjoy hanging out with their friends. However, it is youngest son Abdul who has really come into his own in New Zealand. Growing up deaf, Abdul had trouble adjusting to life in Egypt after the family fled Syria. He struggled with school and wouldn’t play with other children. Now, Abdul is much happier. He doesn’t mind school, is confident enough to ask for what he needs and enjoys playing with his classmates, Mona says. Abdul is learning New Zealand Sign Language at school to help him communicate. The rest of the family has also made it their mission to learn the language, so they can chat with Abdul. For Mona, who spoke very little English before arriving, this has been a particular challenge. She now must learn two new languages: English and New Zealand Sign Language. It’s difficult, but nothing compared to what they’ve overcome. Now, the family hopes more can be done to help those whose lives have been torn apart by conflict. “There are a lot of people suffering in the world who could be resettled,” Ossama says. Across the world, Red Cross Red Crescent volunteers are working to help refugees. In Syria, violence continues with no end in sight. Millions of people have lost their homes. Food and water supplies, hospitals, schools and livelihoods have been destroyed. Desperate families have no choice but to risk their lives to seek safety. The International Committee of the Red Cross and the Syrian Arab Red Crescent are working to provide essential humanitarian aid. Already this year, Red Cross has reached more than 16 million people with clean water, and almost 3 million more with food and essential household items. Every month, the Syrian Arab Red Crescent distributes supplies to 900,000 families. As families continue to seek safety in Europe, Red Cross is there to help. Volunteers are working tirelessly to ensure families have food, shelter, healthcare and psychosocial support throughout their journey. In Greece, where the majority of migrants have arrived, Hellenic Red Cross volunteers have helped more than 300,000 people. Further north, in Germany, Red Cross is running almost 500 emergency accommodation centres. Volunteers are now helping families settle into life in Germany, as Red Cross focuses on promoting social inclusion through activities like language classes and children’s swimming lessons. 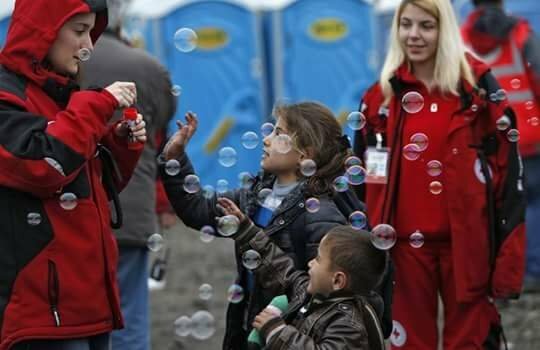 Red Cross volunteers entertain refugee children with bubbles at a refugee camp in Croatia. Red Cross works around the world to help refugees. Croatia Red Cross. ·Become a refugee support volunteer with New Zealand Red Cross. Our volunteers support newly-arrived families, helping with everything from enrolling children in schools to connecting them with local services. Volunteers and families often form long-lasting friendships. Donate quality goods. Former refugees arrive with little more than a suitcase, so we rely on Kiwi generosity to help set up their homes. Find out what’s needed in your area. Give a former refugee a job. Finding employment is a key part of the resettlement process, giving former refugees financial independence and opportunities to use their skills. If you have a position for a new Kiwi, get in touch with our Pathways to Employment team. Donate to help those still in Syria. Red Cross supports millions of people with food and shelter, healthcare, safe drinking water and livelihood projects. The most important thing you can do is to be a friendly face to former refugees in your community. It might not seem like much, but starting a conversation or sharing a meal together can make a world of difference for new Kiwis.